Same pattern -- different look! Time to reuse some of the patterns I have, and try and make them look completely different! 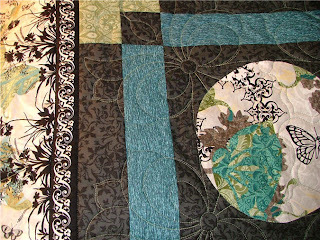 This quilt has a formal name (which I can't remember....) but I call it the Orient Express. It has lots of Asian influence, and beautiful butterflies all over. Any time I see butterflies, I think of my friend Lyn. That happened with this quilt, and then it dawned on me.... the Stained Glass quilt that we just finished for her had a beautiful butterfly pattern on it! That would be a great one to use again! 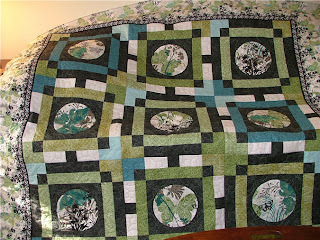 I'm not sure if you can see the design in the close-up above, but it's exactly the same as the design used on Lyn's Stained Glass quilt below. Same pattern, but a totally different look!